Mind maps are more than just brainstorming tools—they have everything you need to carry projects from a loose set of ideas through to completion. I'm a huge proponent of using mind maps in creative work, which you may know if you've read any of my previous articles or follow my podcast. Most folks know mind maps are great for organizing your thoughts and brainstorming ideas for a project. The semi-free-flowing, branched structure of a mind map really lends itself to helping you wrap your brain around whatever it is you're planning to work on. But it doesn't end there. Modern digital mind maps give you so much more. In fact, for me, mind maps are a critical tool for managing my creative projects. A mind map is not just an idea board, it's a living document, a dashboard for planning my projects and tracking my progress. For the examples in this article, I'll be using a handy little open source mind-mapping program called VYM, short for "View Your Mind." If you're interested, I have a pretty thorough podcast episode covering my fairly extensive hunt for a new mind-mapping application. Whether you use VYM or FreeMind or XMind, the approach I cover here should work. The reason why it works in all of them is because the way I work relies on a fairly simple common denominator: the hyperlink. Most modern mind maps can treat a map node as a clickable link. In VYM, you can make any node a link by right-clicking it and navigating to the References submenu. In that menu, you can select the Edit URL menu option and paste any web link as a reference. Most people use this feature to link to websites or online images as reference material. But links don't have to point just to things that are online. They can also be links to local files on your hard drive. VYM gives you convenient access to this capability in the same References menu. Just choose the Edit local URL menu option. VYM will pop up a file dialog, and you can pick any file on your hard drive. As long as you have your desktop launcher configured properly (more on that in a bit), your mind map has everything you need to carry your project from a loose set of ideas through to completion. How about an example? 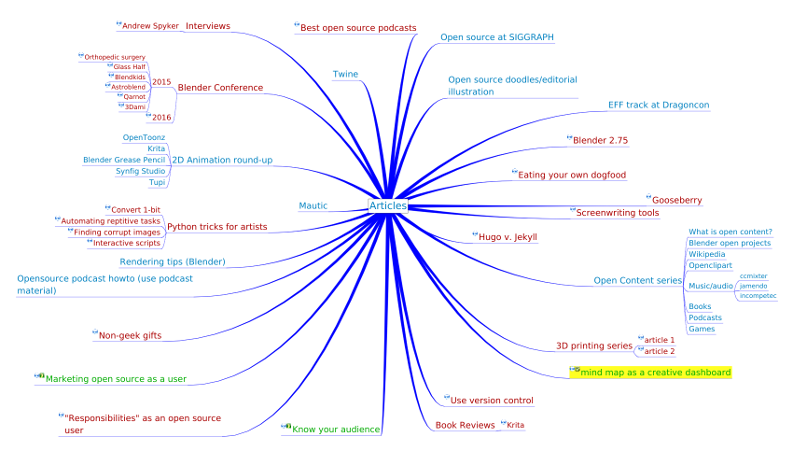 Here's a simplified version of the mind map I use for writing articles on Opensource.com. It's a pretty basic map... a general listing of all of the article ideas I've had, loosely grouped by category, some with reference material attached. See those little icons next to some of the article ideas? They are links to the articles that I've either started or completed. When I click on any of those nodes, it launches my text editor of choice, and I'm off to the races, writing or editing that article. At a glance, I have a pretty good idea of the articles I've completed versus the ones I still need to work on. The key to making this work, as I mentioned before, is having a properly configured desktop launcher. On most Linux desktops, that means either xdg-open or mimeopen. The former is typically installed by default on most freedesktop.org-compliant desktops, though I have had slightly better results with mimeopen (provided by perl-file-mimeinfo). The good news is that both xdg-open and mimeopen use the same configuration files, and they're installed with some sensible defaults. The trick is making your mind map software use them. In VYM, the process is simple. Just go to Settings / Set application to open external links. By default, xdg-open is already set there, but I like to change this to use mimeopen. There are also separate settings for opening PDFs and actual web links. Once you have that set, you can click on any node that you've assigned a link to and fire up the relevant default application. Since I do almost all of my writing in plain text using Markdown syntax, that means either Gvim or Atom, depending on which computer I'm using. There is a caveat to this workflow if, like me, you version-control your projects. The local links that VYM creates are all absolute paths on your hard drive. That means that if you work on multiple computers, your project must be organized with the exact folder structure on all of them. If you want to use relative paths, there is a workaround. You just need to launch VYM from the command line with your project folder as your current working directory. That's a bit kludgy, though. Hopefully VYM's developer will eventually find a way to address using local links that are relative to the location of the mind map file. Caveats aside, this is a really great way to work. When you want to work on a particular project, just fire up your mind map to get an overview of your progress and get started. If you have any ideas or changes to your project while you're working, your mind map is right there for you to add them... a perfect place for keeping notes to yourself. I use this when I write fiction. Anytime I have a new character or setting, I can add it right to my mind map as I'm working. That way, I don't lose track of things as my story grows and develops. In fact, you don't have to limit yourself to just one project. I have a mind map of all of my creative projects. Each active project on that map has a link to its mind map. By taking this approach, your mind map software (in this case, VYM) truly becomes a dashboard for all of your creative projects. And it doesn't end there. I'm still trying other approaches. One approach I've been trying lately with my Opensource.com articles (inspired, in part, by Jason Baker's article on open source alternatives to Trello) is a twist on the kanban board approach. Instead of just having one map center on my mind map, I have three: Ideas, In progress, and Completed. As I work on articles, I drag them from one map center to another, giving me an even clearer sense of my progress. There's one additional approach that I haven't yet tried yet. 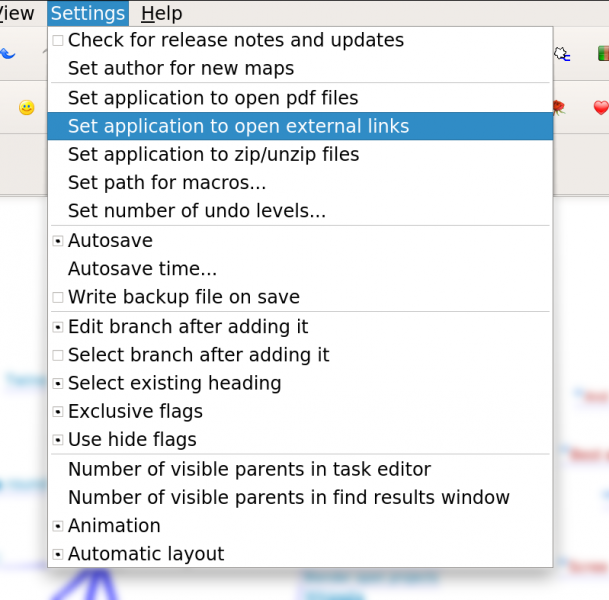 VYM itself is unique among mind-map software: It has an integrated task list you can associate with nodes on your map and a task editor view. You can add any node on your map to the task list by right-clicking it and navigating to the Tasks submenu (or use the Shift+W hotkey). You can cycle that task through various states (Not started, Work in progress, Completed) by pressing W. I've just started playing with this feature, but it already shows a lot of promise for the creative dashboard concept. So yeah, mind maps. They're useful for way more than just brainstorming. I've seen people give talks using mind maps instead of traditional presentation software. They're great for taking notes during meetings (especially ones where discussions organically branch off from the prescribed agenda). And as I've (hopefully) shown here, you can use them to manage your creative projects. Do you use mind maps? How do you use them? Which application do you use? Let us know in the comments. I think that mind maps are interesting, though maybe not for everyone. So far, at least, I can't see myself using them. An interesting book I'm slogging my way through right now is Hannah Arendt's "The Life of the Mind". In it, she asserts that when we think, we think in metaphor. Hard information loses its specificity, its concreteness as we work through some problem, even some idea about some project. Whenever we then try to relate in words something about these thoughts, these ideas, we can only at best approximate what we had in mind, and consequently it will be misunderstood by at least some of our readers/listeners. I think this can be the caveat of a mind map. A genuine mind map might present itself as being more fluid, with variable positions of the elements, specific elements showing various synonyms or even instructive antonyms. Understandable, but mind maps are rarely for an audience larger than 1. I've used collaborative mind maps in the past, but even then, it's a small team. Mind maps are (or can be) part of the process. They're fluid, shifting, and malleable, but the branching structure (and the ability to link/show more media than just text) allow for providing the context and reference for the thought or idea. The output of that whole process (a book, a film, a series of illustrations or articles) is all the final audience ever sees. That said, mind maps aren't for everyone. A lot of people prefer to use structures that are less chaotic and more fixed in their structure. Some folks want *more* chaotic... like scraps of paper littered all over an office wall. As far as I'm concerned, any tool that helps you get stuff out of your mind and in the minds of others is a good tool and the right one to use. For me, that's been mind maps. One thing to mention about the metaphor to words issue is that it's even flawed for ourselves. It's what Arendt called a big dilemma of philosophers. If I have a method, so to speak, I spend a lot of time rolling an idea around in my head (playing with metaphors, I guess), trying to find an approach that I think captures where I want to start and where I want to go. After that, I begin and sometimes things just flow and take shape. For me, perhaps the most important thing is to put what it is aside, then come back to it later -- the idea is to intentionally take myself out of the mindset I had so that I can see if it still makes sense. If not, something needs to change. It might be more like molding with clay than building on an outline. Hi, happy to have read about this. I've been using mind maps (FreeMind) for a long time and it's nice to see others promoting its use. The only comment I've have during these years is why mind maps have not become collaborative. I was about to create a new comment but reading this answer I think that it's better to continue the conversation here. Or maybe there are other reasons I'm overlooking? There are a few web-based mind mapping applications that offer some form of collaboration (I think WiseMapping and perhaps Xmind have this kind of thing). But let me back up a bit. Are you talking about live collaboration a la Google Docs or collaboration like you see in traditional version control for code projects?